Monday saw the opening of Bitcoin Futures on the CBOE, with an initial volume surge, although overall volume was very small compared to mainstream markets. 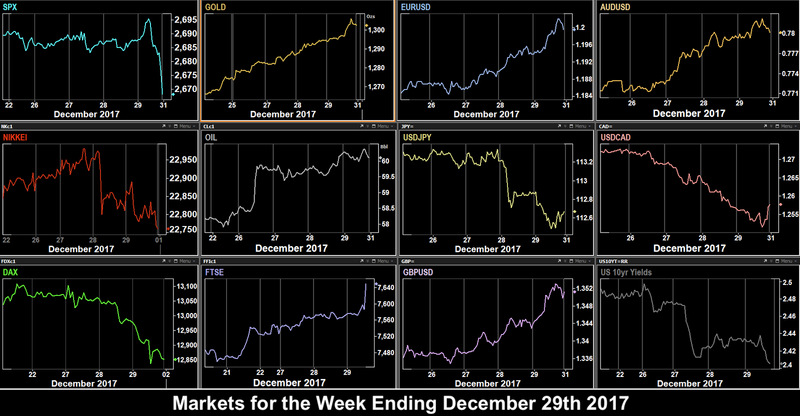 Here is a chart of the first week of the January future, which traded at a premium to the cash instrument quoted on cryptocurrency exchanges. Back in the real world, SPX and DJIA continued their advance to new closing all-time highs again, although the picture was not universal. NKY was flat, and DAX slipped. FTSE made gains but this was largely a reflection of weak GBP, down 0.4% on continued Brexit negotiation fears. Oil and energy stocks were up sharply, on news that the North Sea’s main oil pipeline had developed a crack, and would be closed “for weeks” to facilitate repair. NZD was up over 1% on the market’s approval of the appointment of new RBNZ Governor Adrian Orr. The other currencies were generally flat, with USD giving up less than 1%. Gold declined again, its biggest five-day drop in over six months to a five-month low of $1,242. US Treasury 10-year bond yields were up slightly. Tuesday was a turnaround day for DAX as it often is, and the index recovered Monday’s losses. FTSE continued to rise, again helped by a falling pound, which spiked briefly on the UK CPI beat, before resuming its downward trend. NKY repeated Monday’s pattern, a dip in the Asian session, recovery in futures during the European and American day, to end up roughly flat. However although SPX made another intraday all-time high, it receded to end the day slightly down, as oil gave up the previous day’s gains. The day was strong for USD, with DXY hitting its highest level for a month. Yields were up in line, and Gold hit a new low for the week of $1236.39. The only currency to advance was AUD, which is not part of DXY. Wednesday produced the long-awaited Fed rate hike of 25 basis points, and a continuation of current policy. 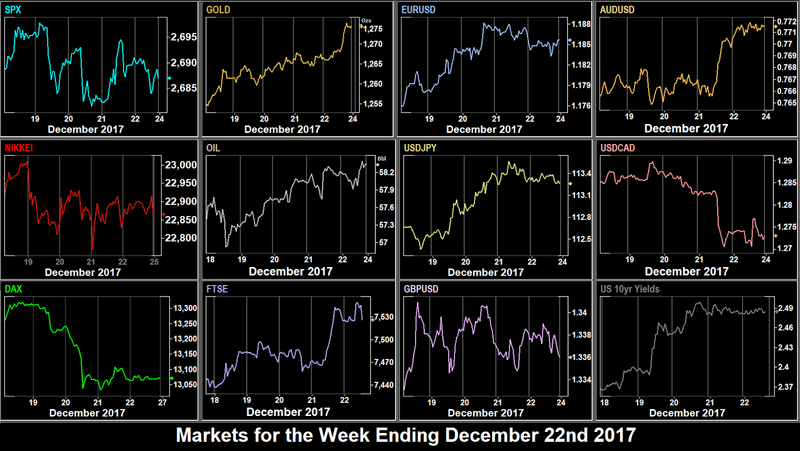 As we predicted last week (as about 10% of traders were expecting 50bp), the dollar fell sharply against all currencies, yields were down and Gold was sharply up. The greenback had been falling all day, not helped by a miss on the ‘ex food/energy’ CPI print at 1330, but the pace accelerated after the Fed announcement. Oil also fell, despite the EIA Stock beat at 1530. Indices. Despite all this, SPX managed to eke out yet another intraday high of 2671.88 before closing roughly flat. Other indices were down, no doubt partly because of their respective currency strengths. Concern about the pace of the tax bill resurfaced on Thursday when Marco Rubio said he would not vote for the bill unless some changes to child tax credits were made. SPX gave up all its gains for the week so far (an inverted-V). The other indices followed suit. DAX had a brief rally mirroring the fall in EUR after the ECB press conference at 1330, however this did not last, and it fell in the US session to finish down. In general USD had a good day, and was up against all currencies except AUD and CAD, the latter seeing a 150 pip surge after hawkish comments from BoC Governor Poloz after his speech at 1725. In line with the USD performance, Gold fell slightly, but yields did not respond and were flat on the day. Notably, the GBP rate hold had little effect on the market, whereas EUR which had rallied sharply on Wednesday gave up over half those gains. Oil touched a bottom for the week, but ended the day up. 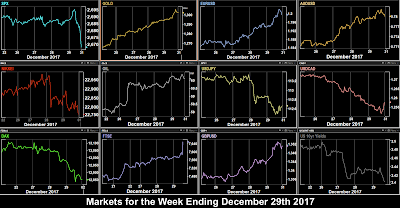 Friday saw Senator Rubio change his mind and agree on his tax bill vote, and SPX and DJIA made closing all-time highs again. DAX, NKY and FTSE were also up substantially as their denominated currencies weakened against USD. GBP and CAD were sharply down to Tuesday’s level, forming inverted-V shapes for the week. Surprisingly, given the dollar strength, Gold and bond prices (inverse to yields) were slightly up. Oil had its flattest day of the week, ending only slightly up. These are the prices movements for the week on the instruments we cover, with a generally retreating USD picture. However, for the second week in a row, CAD was the worst performer, and so he best forex and overall trade would have been to buy NZDCAD, up 2.4%. Despite the SPX ATH, the strongest index was, for once, FTSE up 1.17%. Only EURGBP had an inside week. The weekend seems the South African ANC congress, with the party’s announcement of their new president. Expect movement when the markets open. The ZAR is already at a three-month high on expectations that Cyril Ramaphosa will beat the incumbent Jacob Zuma. The week is expected to be light, given the approaching holidays, with the tax bill being centre stage. Monday opens the final week before the Christmas holiday. It is possible there may be a Senate vote on the tax bill, although it is more likely to be on Tuesday. The only significant data release is Eurozone inflation. In India, results are expected for the Gujarat provincial election, Prime Minister Modi’s state. It is expected to be a pointer to his chances of re-election in 2019. Tuesday sees the Australian RBA monthly minutes in the Asian session, although little reaction is expected. The Senate vote on the tax bill is expected, and if they have voted Monday, then it would be the House vote. ECB Hansson speaks at 0900GMT on the outlook for Eurozone, and we have the forward looking US Housing Starts. Wednesday is the final day if the EU Withdrawal Bill Committee Stage, although there is no vote yet, and the aim is for the tax bill to be with Trump for signature. BoE Governor Carney speaks to the UK Treasury Select Committee on the November Financial Stability report, but no volatility is expected there. The Swedish Riksbank rate decision is at 0730. A hold and extension of QE is expected. SEK is 4.2% of DXY. Thursday’s Asian session has the BoJ rate decision, although this rarely causes the same volatility as other major currencies. In Europe there is a Catalonian regional election. A pro-independence result is likely, although no particular new activity regarding secession is expected. The CZK interest rate decision is at 1200. The major data releases of the week come at 1330, US GDP and the QoQ Personal Consumption Expenditure, an inflation proxy. This is probably the strongest trigger (other than the tax bill) for USD this week. Also important is Canadian inflation and Retail Sales, also at 1330. We know that CAD likes to make strong sudden moves. Friday is a half-day for markets in the UK, Canada and New Zealand in early observance of Christmas Eve. Markets will be winding down, so volume is expected to be light. However, funds may well be rebalancing, and traders may be closing positions for the holiday period. Canadian GDP is reported, and If there had been a sudden move on Thursday, a print in the opposite direction could reverse that move. It is also the next US government shutdown deadline, although commentators are not factoring this in, expecting there to be yet another extension. Next weekend, our report will be somewhat shortened, given the holiday period. MatrixTrade is open for business on all days that the market is open. Monday saw the effect of the tax bill being passed in the Senate. Indices gapped up and SPX made yet another new intraday all-time high of 2665, but a sharp 100-point sell-off in NDX dragged SPX down to finish 0.1% on the day. NKY followed suit, but the European picture was mixed. After some volatility, DAX edged a small gain, but although FTSE was flat by the cash close, overall it was down on a strong British pound, which rose sharply on positive Brexit news, although some of these gains faded later. Otherwise USD was slightly down against JPY and CAD. Gold, EUR, AUD and 10-year yields were flat, and Oil was down slightly. Weakness in equities continued on Tuesday, fuelled by misses on US Trade Balance (1330) and PMIs (1445/1500), and concern that the Senate had failed to repeal corporate ‘alternative minimum tax’, a provision which limited the tax advantages for some companies. DAX and FTSE also fell, although NKY managed to stay flat. In forex, AUD put on 50 pips (0.67%) on the Retail Sales beat at 0030, and the Chinese Caixin Services beat at 0145. There was however little reaction to the rate hold. These gains were given up in the European session to end flat on the day. Otherwise USD was slightly up across the board (as were yields), with GBP faded particularly sharply. It then recovered in an almost perfect reversal of Monday’s price/action. Gold fell $9 to £1,266, and touched a two month intraday low of $1,261. Oil was generally flat after a choppy day, on concerns that the rising price will re-open significant US shale capacity. Early Wednesday was the low point of a V-shaped week for all equity indices. NKY started the ball rolling in the Asian session by giving up 300 points (1.33%), its biggest one-day drop for eight months, the HSI fell 2.1%, and when the DAX future opened at 0700, it immediately gave up 150 (1.15%) points before the cash index and component shares opened. FTSE and SPX had sold off the previous day and so were not affected. Having touched these lows, all indices then recovered throughout the European and US sessions, helped by the ADP jobs beat at 1215, and closed positively, but not by much. USD had a similar low point, and recovered today. The dollar was up against all currencies, and Gold was down again to a new low. Surprisingly bond yields did not respond and ended 3bp down. As we predicted last week, the Canadian rate decision (1.0% hold) caused a 153 pip (1.21%) spike up for USDCAD, reversing most of last week’s payrolls movement, but no doubt assisted by the sharp drop in the price of Oil. AUD was very volatile after the GDP miss, and ranged 0.86% with a minute, a rare stop-hunting exercise we rarely see these days. It ended up 0.6% on the day. 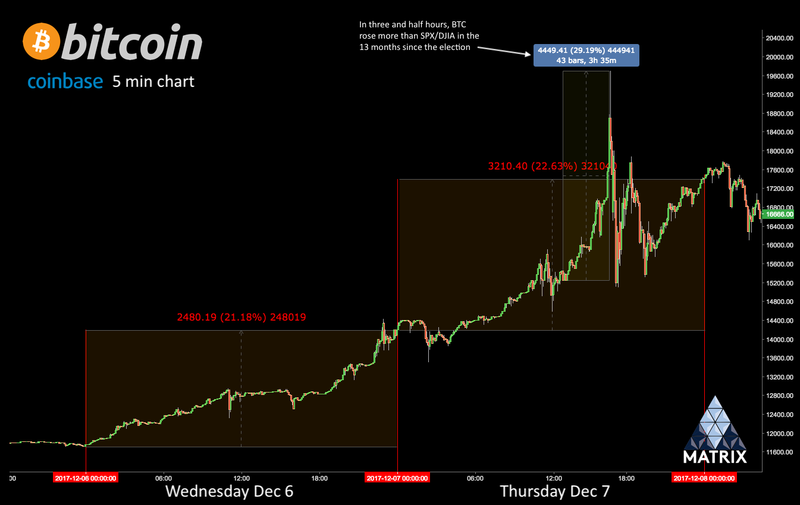 However, the story of the day was Bitcoin, which put an amazing 21.18% on to reach a new record high of $14,099. The move was so extreme that there were huge differences between the various exchanges. We are quoting Coinbase (gdax.com) which was the most extreme. The price was $5,870 three weeks ago. But it didn’t end there. Thursday was a quiet day for news. HoweEquities continued upwards, and as tech stocks belatedly joined the party, we finally got the risk-off triple signal: Gold, JPY and bonds (inverse to yields) were all down (This was despite further falls in China). The only index to fall was FTSE, as GBP rallied sharply in the US session, putting on 165 pips (1.24%) between 1200 and 1830, on news that the UK had settled the Northern Ireland border issue. Other than against GBP, the dollar was stronger against all the other currencies. It was another risk-on day with Gold and bond prices falling with JPY. GBP and JPY completed their V-pattern returning to their Monday levels, and Oil moved in that direction as well. And if you thought the previous day’s Bitcoin was a spike, today was without precedent. The Coinbase exchange reached an intraday high of $19,694, that’s 39.6% on the previous close. It then pulled back 23% in 15 minutes, the largest and fastest pullback in the crypto-currency’s history, to finish ‘only’up 22.63% on the day. In the three and a half hours before the spike, BTCUSD rose more than SPX has risen during the entire Trump presidency. We have often said that one sign of a top is when everyone is talking about something, ie it moves out of Wall Street into Main Street. Thursday’s Bitcoin surge was the lead story in the London Times on Friday morning. We told you last week that Friday was the government shutdown deadline. As he did earlier in the year, President Trump signed another stop-gap bill, to kick the problem down the road, but this time only for two weeks (until December 22nd). NFP did not disappoint, beating the revised (something we also mentioned last week) estimate of 200k by 28k. Unfortunately, the sticking point in the economic recovery, as we have mentioned before, is Average Hourly Earnings which missed (print 2.5% vs est 2.7%). You can see from this chart how this month’s print was particularly poor. In currencies, JPY continued downward, but otherwise USD was flat against other currencies. Gold and bond yields were also flat. Oil decided to join the V-shapes by recovering all Wednesdays losses, putting on $1.25 (2.21%) at one point. Bitcoin was quiet too, it ‘only’ dropped 5.37% by midnight. These are the prices movements for the week on the instruments we cover, with a recovery across the board for USD. The best forex trade would have been to buy USDCAD, up 1.29%. For the second week, NIFTY was the most volatile index but for the first time in ages, the worst performer was Gold which had its worst week since the beginning of May, making a four-month low. As we enter the penultimate week before the holiday closure, it will be interesting to see if the packed schedule produces the volatility you would expect, given potentially declining volume. Over the weekend we had China PPI and inflation figures, which missed (YoY CPI 1.7% vs 1.8% est). In New Zealand, Finance Minister Robertson speaks at 1900GMT Sunday, followed by Retail Sales at 2145, when forex markets are open. Monday is quiet, although the US10Y auction may jolt the current yield price out of the torpor it has shown in the last two months. The next round of NAFTA talks start, and will last all week. One interesting event is the opening of XBT Futures (at 2300), the new CME instrument to trade Bitcoin without going to the trouble of wallets etc. For the first time institutional and professional investors, including HFTs of course will be active in the short-term market. Volume is likely to be enormous. If you thought Bitcoin was volatile already, wait for this. Tuesday is important for AUD with the Australian Outlook Report. Also Governor Lowe is speaking at 2215. UK inflation is expected to rise to 3.1%, although it is so close to the rate set on Thursday, that it is unlikely to affect it. The Alabama Senate seat election (to replace AG Jeff Sessions) will report the result after the markets have closed. With Trump’s thin majority, failure of the controversial candidate Roy Moore to hold the state for the Republicans can only be seen as negative for the markets. Current polling has Moore ahead by seven points, but we all know how accurate pollsters have been in the last couple of years. Moore leans to the right of the party, so he will be a safe voter for the Trump agenda. Wednesday is the long awaited December rate decision. 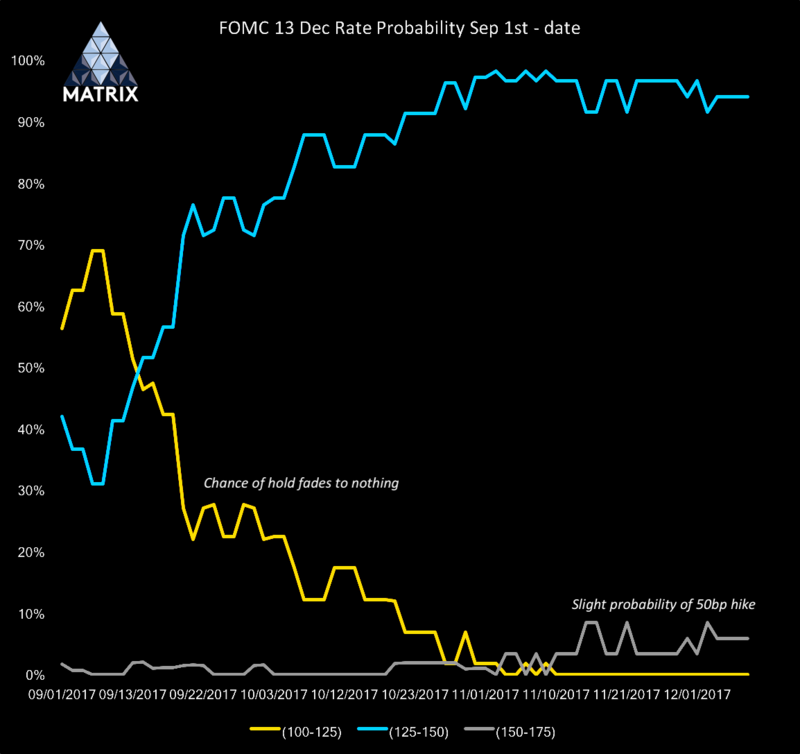 A hike to 1.5% is widely expected, although the CME FedWatch tool actually has a non-trivial 9.8% chance of a 50bp (to 1.75%) raise. Traders will look for hints to further rate rises, and if they are not found, this suggests that the 25bp increase may actually depress USD. As well as the Alabama result, there is also the important inflation print at 1330, although clearly this is far too late to affect the Fed news. The German inflation and UK unemployment figures make EURGBP worth watching in the European morning session. Thursday is even busier than Wednesday, and it all happens very quickly. Following Eurozone PMIs and UK Retail Sales, we have a 90 minutes period with both GBP and EUR rate decisions/statements, and the important US Retail Sales. Expect considerably volatility in both currencies against each other and USD. If that were not enough, the two-day EU Council meeting begins, and it is vital for UK PM May that the EU27 confirm that “sufficient progress” has been made, although this may not come until the following day. In relatively minor news, there are also rate decisions on CHF, NOK, TRY, and MXN (and for that matter South American currencies COP, CLP, and PEN), the NZ Outlook Report at 0000, and the Australian ‘NFP’, BoC Governor Poloz speech at 1740 (published at 1725). All this as USD follows post-Fed volatility, and NAFTA, the tax bill reconciliation, Russiagate and Brexit roll on. Is that enough for you? Friday doesn’t have much in the way of releases, but the Eurozone and NAFTA conferences end, and some traders will be finishing for the holiday and therefore rebalancing their positions. BoE newly-converted hawk Haldane speaks at 1315. Russia makes a rate decision, a 25bp cut is expected. 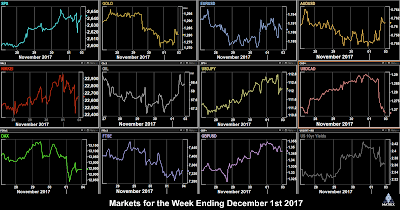 The markets entered the week after Thanksgiving quietly. As we predicted last week, AMZN made further gains on Monday, gapping up past $1,200 to close the day $10 up. However, a 0.72% fall in the Shanghai Composite index weighed, and all indices were down. However SPX, NDX, and DJIA managed to eke out slight new all-time highs. The slight risk-off mood was confirmed by advances in Gold, JPY and bond prices (inverse to yields). Otherwise USD fell in early trading, but recovered to end the day slightly up against all other currencies. Oil was down ahead of the OPEC meeting. Once again we had Turnaround Tuesday. All indices were well up (with further US ATHs) on the tax cut momentum, and comments from new Fed Chair Jay Powell on easing of financial regulation. Gold and JPY were down as were bond prices initially, although they ended up flat. After an initial dip, GBP was up on the day after it was confirmed that the UK intended to fully honour the Brexit ‘divorce bill’ removing the largest obstacle to a post-Brexit trade deal. However, it was on its own, all other currencies fell against the USD and DXY was 0.4% on the day. Oil was down slightly again, down 0.2% to $57.99 anticipating the API Stock miss at 2130 after the pit closed. On Wednesday SPX and DJIA were up again, touching new intraday highs after the US GDP beat at 1330. However, other equity indices fell, NDX giving up 1.20% on the day, as tech stocks rotated into financials. DAX and FTSE posted losses, the former despite the inflation beat at 1300, and NKY was roughly flat. The ongoing progress in Brexit pushed GBP above $1.34 to a new two-month high. USD rose against all other currencies except EUR, which rose slightly, with a net result of a flat DXY. This was reflected in higher bond yields, up 6bp at 2.39% and lower Gold prices. The market still had no news on the OPEC cuts, and after an early rally, Oil dropped sharply by $1 (1.71%) on the EIA stock miss, although unusually, the sell off was into the miss. The price recovered 45 minutes later, to sell off again into the close. Thursday was a blowout for US indices after Trump critic and former presidential candidate John McCain confirmed he would support the tax bill, with DJIA putting on 1.28% and together with SPX making another ATH. NKY also ramped as JPY continued to slide along with Gold and bond prices (inverse to yields), very much risk-on. The mood was not shared in Europe, DAX and FTSE both fell after early rallies following the German Unemployment beat at 0900. 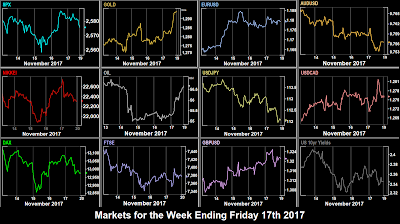 The forex trend for the week continued with GBP (and EUR) outperforming the dollar, but other currencies giving up ground. Oil performed an almost exact repeat of Wednesday’s price action, as OPEC and Russia agreed to extend cuts until the end of 2018. Friday was the most volatile day of the week, and indeed for many months. SPX had given up 1% in the Asian session, and was slowly climbing again on anticipation of the tax cut, when a bombshell dropped. Trump’s former national security advisor Michael Flynn had already pleaded guilty to lying to the FBI, but an ABC report at 1600 (1100 EST) said that Trump instructed him to contact Russian officials before the election which would have been illegal. SPX immediately dropped 45 handles (1.7%). However, it turned out that the story was “fake news”, and the instruction was actually issued after Trump became President-elect, a perfectly normal action. The market quickly recovered and finished the day slightly up, although it couldn’t quite make another high. The picture elsewhere was mixed. USDJPY fell on the Flynn news and did not recover, and NKY, already down, fell with it. DAX had already collapsed in the morning, and did not recover. Only FTSE managed modest gains, as GBP turned down slightly after a week of gains. We promised volatility in CAD last week, and we got it. In a standout move, the loonie recovered all the week’s losses, after the best jobs report for over four years. The print of 79.5k (equivalent to 715k in US NFP terms) blew away the 10k estimate, and CAD put on 193 pips (1.5%) on the day. This was of course helped by the weakened dollar and a sharp (2.5%) rise in Oil as traders digested the OPEC news. 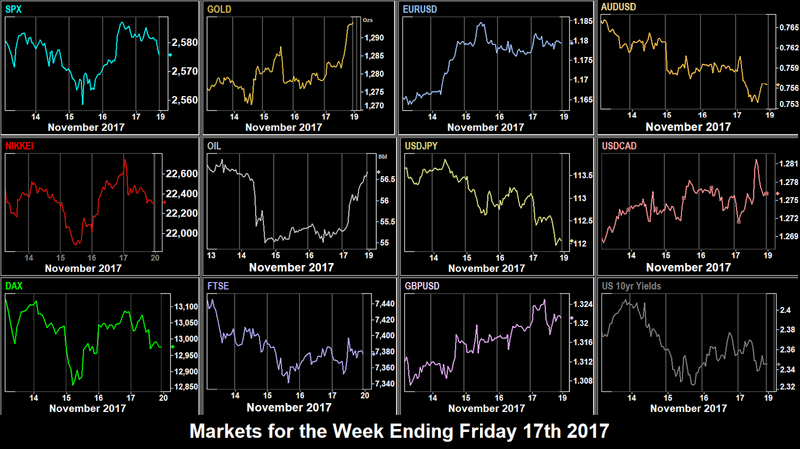 All the currency patterns for the week were reversed, EUR and GBP were down, whereas AUD and Gold were sharply up in line with JPY. Bond yields were also down. These are the prices movements for the week on the instruments we cover, with a mixed USD pattern. The best forex trade would have been to buy GBPJPY, up 1.76%. For once, NIFTY was the most volatile index and overall biggest mover, down 2.58% on poor fiscal deficit news. 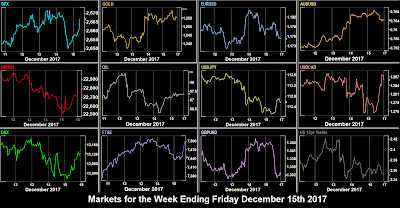 Another busy week ahead with two rate decisions and NFP, not to mention the ongoing tax bill and Flynn situations. Early on Saturday morning, the Senate passed the tax bill as expected, and Greece (remember them) reached a preliminary deal on further reforms needed to leave the bailout plan next August. Monday is deadline day for the UK Government to come up with an improved ‘divorce’ offer. ECB member Costa speaks in Portugal, but news is light, and we expect the tax bill and the Flynn case to continue to dominate. Tuesday has a raft of PMIs, but the main area of focus is Australia, where retail sales is reported shortly before the interest rate decision. AUD is still very weak and traders will be listening for policy guidance, although little is expected. There is also a rate decision in Poland. Wednesday gets busier. The House and Senate start to reconcile their versions of the tax bill. ADP, the ‘sneak preview’ of NFP is published, with an estimate 15% higher than the NFP estimate. The biggest news of the day is the Canadian rate decision. It will be interesting to see if this pushes USDCAD up, having reached channel support last Friday, or whether hawkish remarks push CAD higher. On Thursday, Germany’s ruling SPD party starts a three-day convention in Berlin, the pressing issue being the still unresolved coalition. There are some signs of hope which would be positive for EUR and DAX. The main news release is Eurozone GDP, although the effect of this is muted as it comes after the individual countries report. Friday is the US government shutdown deadline, although there are already plans to avert this with a stop-gap bill. The big news, as always is NFP, with particular focus on wage growth (AHE) if the figure is broadly in line with estimates. Please recheck the estimate on the day, as it has been known to move as the week progresses. The German coalition problems weighed on Monday, causing pressure on EUR during the Asian session. It rebounded sharply at the European open, only to fade again and end the day roughly flat from Friday’s close. DAX reacted inversely and was up 0.5% on the day. It was risk-on as Gold, JPY and US 10-year bond prices (inverse to yields) fell heavily. The Bund was flat. SPX NKY and FTSE were also up on the day, the latter being in spite of GBP also being up on positive Brexit news. 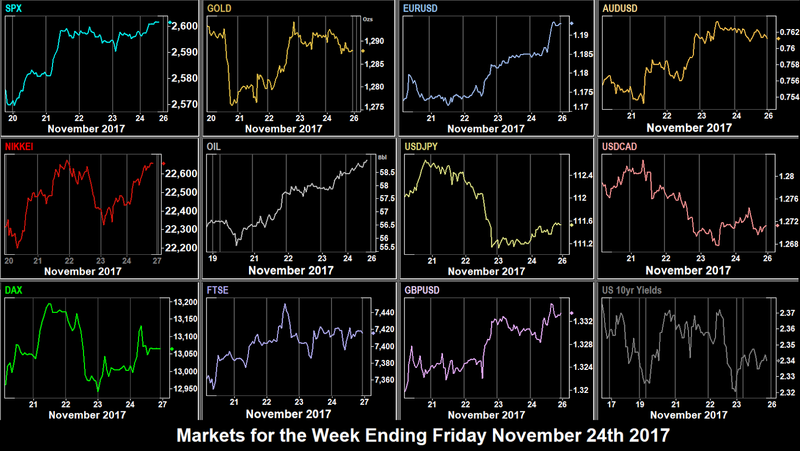 In a similar pattern to last week AUD was down with Gold, and CAD was down with Oil, which took a slight rest from its upward trajectory. Tuesday was another good day for equities with SPX ramping to touching another all-time high, briefly breaking the 2600 roundpoint. DJIA, NDX and RUT closed at fresh records. DAX added 1% on a flat Euro, and FTSE and NKY added to Monday’s gains. Yields were down as was USD against all other currencies, and so was Gold and Oil, the latter making another two-year high after the API beat at 2135. Something very strange happened in Hong Kong. The HSI cash had just closed at 0900, touching a record and roundpoint 30,000. 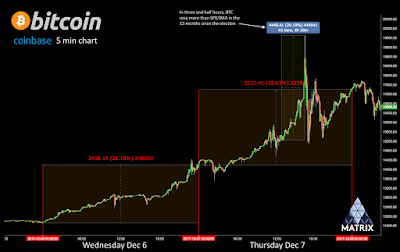 When the futures opened at 0915, there was a huge 4.5% momentary spike (to 31339) which immediately retraced. This then induced volatility and the index traded between 30,200 and 29,600 for the rest of the week, completely unlinked to other indices. Wednesday saw the UK budget, and as we predicted last week, housebuilding stocks moved sharply downwards on news that the government is going to investigate their land-banking policies. FTSE had spiked up in the morning, but gave all that up after the Budget to end the day a mere 0.1% up. SPX showed its strength by only falling 0.1%. 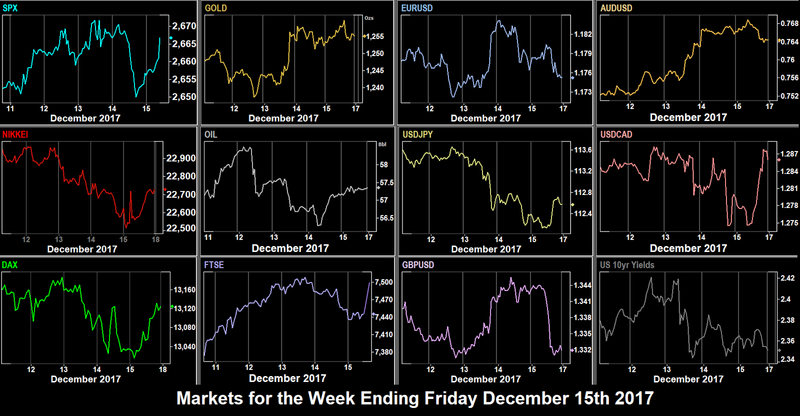 However, NKY was down sharply as JPY rose, as was DAX, giving up the gains earlier in the week on continued German political uncertainty, but partly on a rising Euro, which in turn was the effect of USD which had been falling all day again (against all currencies) and was accelerated by dovish FOMC minutes. The December hike is fully priced in (in fact, CME Fedwatch now has an 8.5% chance of a 50bp hike rather than 25bp) , but the minutes showed concern about low inflation. DXY hit its lowest level for a month. As you would expect Gold and bond prices rose quite significantly. Risk-off again, and Wednesday turned around Tuesday. Oil was flat, despite the EIA miss at 1530. Thursday was Thanksgiving and US and Japanese markets were closed. Of course futures were still traded around the world, but volume was thin, and so were the price movements. Indices were all slightly up, despite a heavy sell-off in China (see HSI note above). DAX had an early rally despite the GDP miss at 0700, mixed PMIs at 0830, and a climbing Euro. SPX futures were active around this time, but stopped moving around the time the US session would have opened. 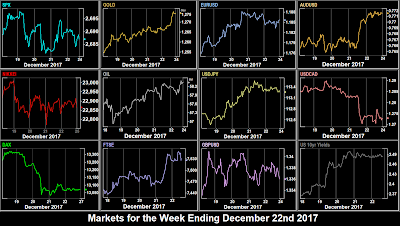 Currencies were directionless on this holiday, with EUR (after the Eurozone PMI beat), and AUD slightly up, but GBP (after UK GDP came in as expected), JPY and CAD slightly down. The Canadian Retail Sales print was interesting. It missed, but it is not normally regarded as a high-volatility event. However on this day of thin trading, the miss caused CAD to drop an instant 42 pips (0.33%), and continue to fall until Friday morning. The overall effect was that DXY edged down another 0.1%, Oil continued its advance to new (two year) highs, and Gold was flat. The bond market was closed. Friday was a half-holiday in the US, and of course the famous Black Friday shopping day. Even without any instant sales results, AMZN traders just assumed they would perform, and the shares rose throughout the short session to finish 2.67% up on the day and 5.37% on the week. Similar enthusiasm was shown across the board, with all indices rising again, SPX and NDX closing at record highs, and the VIX at an all-time low. DAX and EUR rose in unison (the latter to a two-month high). following the upbeat IFO sentiment prints at 0900, and some progress on German coalition talks. NKY was also up as JPY fell (with Gold - risk-on again), and only FTSE struggled with rising GBP to end flat. 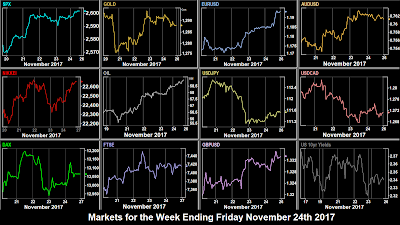 Surprisingly, despite USD falling against all currencies except AUD (a Gold proxy), and particularly against EUR, leading to a 0.4% fade in DXY to a now two-month low, bond yield were actually up, although this was a gap-up following Thursday’s holiday. Oil was up again, this time following news of a leak in the Keystone pipeline, and expectations that cuts will be extended at next week’s OPEC meeting. As we move into the final week of November, and the holiday season, the question is are we poised for the Santa rally, covered in our email earlier this week. Monday is a quiet day, as is the weekend. However, there may be some delayed volatility following the holiday on Thursday and half-holiday on Friday. In particular retail stocks which report a bumper Black Friday should see movement, although retail leader AMZN already rose over 2% on the day. Tuesday’s highlight is the confirmation hearing for Jay Powell, the new Fed chair at the Senate Banking committee at 1445. Traders will be looking for any variance from Janet Yellen’s views. There is also a BoC press conference at 1615, with Governor Poloz and Senior Deputy Governor Wilkins. Economic data is light. Wednesday is stronger on data, with German inflation (giving a hint to Eurozone inflation the next day), followed by US GDP and QoQ Personal Consumption Expenditure, the latter being a strong inflation proxy. Fed Williams (centrist) is speaking at 1745 after Janet Yellen. Thursday is month end, and some volatility should be seen for month-end rotation. Main news is German unemployment and Eurozone inflation. The MoM and YoY PCE figures are important, but any serious change will have been shown in the QoQ on Wednesday. OPEC hold a one-day meeting in Vienna, and are expected to discuss cut extensions, which have been working well, and of course have driven up the price of Oil 28% in under five months. A six-month extension is the consensus, so a longer or shorter period would most likely produce a noticeable move in the price. There is also a minor speech from Fed Kaplan. Friday sees a new month, and a raft of Markit Manufacturing PMIs. These don’t in themselves tend to move currencies much, but as always, a big miss from one and a strong beat from another could move the pair in question. The final Manufacturing PMI of the day is the US ISM at 1500. This is more important, although no large variation is expected. Although it is the first Friday of the month, the US NFP data is not until next week. However, the Canadian jobs report is today, with a modest 10k estimate, along with Canadian GDP at the same time, so volatility in CAD is very likely. NKY fell 1.3% in the Asian session on Monday partially giving up spectacular gains in previous weeks, but also affected by the continuing oil price rise. Japan imports all its oil. Otherwise it was fairly flat for indices after the previous week’s red candle. Nevertheless, SPX managed a 0.1% rise despite the 7.6% drop in GE after they announced a dividend cut. DAX fell sharply, down 165 points at one point, and breaking the psychological 13,000 barrier. However it recovered in the US session to close only 18 points down on the day. Currencies only moved slightly, and were mixed. DXY was slightly up (0.11%) on the day and 10-year yields advanced 1bp, but this belied a mixed picture. EUR was up a little, JPY was flat, GBP fell 0.5%, and AUD and CAD were notably down. Gold and Oil were also flat. Tuesday was another weak day for equities, and all indices fell, in particular DAX which was reacting to a strong Euro. Markets also reacted to a sharp drop in Oil, down 3% on the day, and further weakness from GE, the SPX and DJIA’s oldest component. EUR had its best day for months, up 1.13% after German GDP beat expectation at 0700 and Eurozone GDP held as expected at 0.6% at 1000. GBP also rose 50 pips (0.4%) on the UK CPI beat at 0930. The risk-off in equities was confirmed by the classic rises in JPY and Gold, and fall in yields. Only AUD and CAD failed to make progress and were flat on the day. The equity downtrend continued on Wednesday, with all indices lower. Analysts cited high PE ratios (important) and uncertainty about the slow progress of the tax reform. In particular the SPX recorded its biggest one day drop in ten weeks, although this was only 0.6%, but the VIX touched its highest level since mid-August. Currencies were again mixed, despite the beats on US Retail Sales and CPI at 1330. GBP and JPY were slightly up, and yields were down. However, EUR gave up a little ground after an early spike to a one-month high, and AUD and CAD were down again, as was Gold. Oil was flat on the day. AUD in particular fell sharply (53 pips) on the big Consumer Confidence miss (-1.7 vs +3.6) at the Asian session open, and this fade held all day. 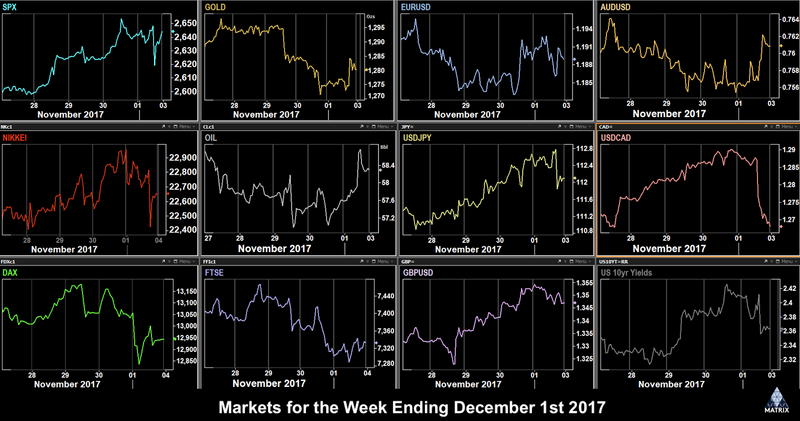 On Thursday, the House of Representatives voted to approve their version of the tax bill, and this turned the trend in equities. SPX was up 0.8%, erasing the week’s losses, and other indices followed suit ,and bond yields were up. It was not completely risk-on, as although JPY only faded slightly, and Gold was even slightly up on the day. DXY was almost flat (0.09% up), because EUR was nearly flat (after the Eurozone CPI came in as expected at 1000), and GBP and CAD advanced. AUD and Oil were flat on the day. The Australian payrolls miss at 0030 (3.7k vs 17.5k) had surprisingly little effect. Friday was option expiry day. The reversal in indices was short-lived, and the downtrend resumed — SPX was down 0.3%. FTSE manage to remain flat, perhaps on the ramp in Oil, which nearly recovered all Tuesday’s losses, possibly because of option expiry and rollover, although there was remarkably less contango this time. This was put down to fresh news that US Special Prosecutor Mueller has issued subpoenas to several of President Trump’s campaign officials. In line with this, Gold, JPY and bond prices (the inverse of yields) were up, as were EUR and GBP. CAD fell sharply after the CPI print came in as expected at 1330, giving up 0.5%, although most of this was recovered by the end of the day. Nevertheless, CAD and the beleaguered AUD ended the day down. So in summary, a risk-off week seeing appreciation in Gold, JPY and bond prices, and a clear separation between EUR and GBP advancing, and AUD, NZD and to an extent CAD fading. However, despite a change in sentiment from, say, two weeks ago, SPX only fell 0.18% on the week, and is still up on the month. These are the prices movements for the week on the instruments we cover. A risk-off week with JPY and Gold both up, and all indices down, but otherwise a mixed picture for USD. A bad week for AUD and NZD, and the best forex trade would have been to buy EURNZD, up 2.74%. After four weeks as the strongest riser, it is not surprising that NKY fell the most this week. The holiday season starts this week, and data is light, and the FOMC and ECB Minutes will be the main events. On Monday, we get a lot of ECB speakers. Draghi speaks at 1400 and 1600, and also on the roster are Nwotony at 1145, Lautenschlager at 1215 and Constancio at 1415. Data is light. Tuesday sees the RBA minutes, and also a speech from Governor Lowe. AUD touched a five-month low last week. Traders will be wondering how low it can go. The monthly GDT milk auction has had little effect on NZD recently, but give the currency’s recent strong move to the downside, again this is one worth watching. Wednesday is a bit busier, with the UK Budget statement, although this is primarily a tax change bill, and nothing major is expected, except in the area of housing. Volatility will probably be limited to UK Housebuilding stocks. The FOMC minutes will be keenly watched. 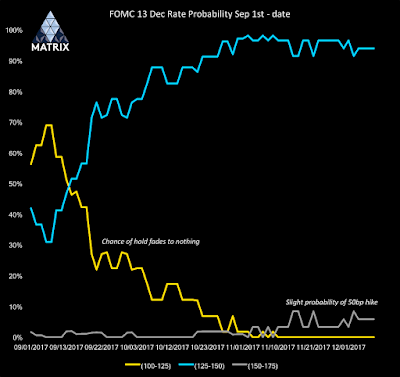 The current consensus on the CM FedWatch tool is a 96.7% chance of a hike in December. Any dovish remarks which put this in doubt could therefore put negative pressure on USD. The US Durable Goods print is not expected to produce much volatility, given its proximity to the Fed minutes. Thursday is Thanksgiving and US and Japanese markets are closed. (Japan call it Labor Thanksgiving Day). Trading is therefore expected to be very light. Focus is of course on Europe, with UK GDP and then the ECB Minutes. The latter is the big event, watch for EURUSD volatility all day. There is also a rate decision on the South African ZAR, 6.75% hold expected. Thanksgiving is followed by Black Friday, the retail bonanza. Expect bullish announcements from AMZN even before the end of the day. US Markets are open, but expect reduced volatility as many traders make a long weekend of the holiday, and data is light.